It’s been a long time since a Burnout game last released. While Burnout Crash was technically the swan song for the series, most fans consider Paradise to be the final “true” entry from developer Criterion Games (or, if you’re me, the 360 port of Revenge). Ever since EA put the team to work on Need for Speed, we’ve basically not heard a thing about Burnout. Seeing as how that series is basically dead, it has fallen onto Three Fields Entertainment to pick up the mantel. Founded by Alex Ward and Fiona Sperry, previously the founders of Criterion Games, Danger Zone is looking to rekindle the excitement that Burnout’s Crash mode exhibited. Will this bite-sized downloadable game be able to live up to the pedigree of its forefather? As far as presentation goes, that answer is going to be a blunt no. 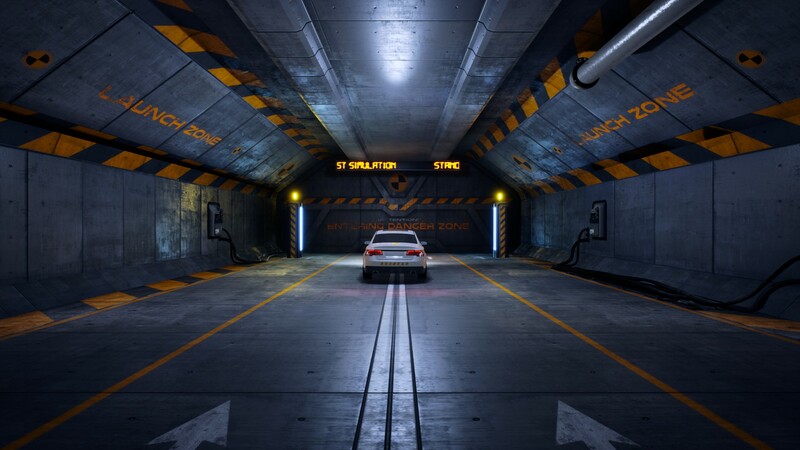 While I understand the idea behind what Danger Zone is doing (putting it in a virtual crash test facility to allow for endless possibilities), the aesthetic never changes from level to level. Maybe looking at highways and byways all the time in Burnout wasn’t radically different, but it showcased a lot of color and brought a more realistic sense of destruction to the proceedings (even if your car went sky high). From my time with a preview build of Danger Zone, I never felt like what I was doing had the same kind of impact. It’s fun to plow into traffic and blow my car up, but seemingly disrupting the peace of a busy intersection was a part of the joy in Burnout. I don’t really care if I’m destroying a computer simulation (which I technically was doing in Burnout, but that is beside the point). That being said, at least the game is functionally the same as past efforts. Danger Zone is similar to the formula that Criterion perfected with Burnout Revenge. You get a quick flyby of each zone before being thrust into the action and told to wreak havoc. 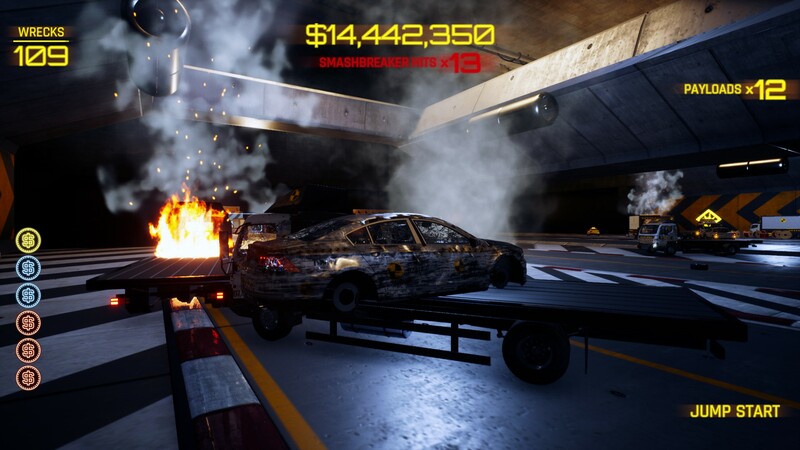 There are even Smashbreakers that work exactly the same as Burnout’s Crashbrakers; after you build up enough wrecks or fly through one of the pick-ups scattered on the level, you can press B and explode your car for more damage. You don’t get as much slow-motion control as Burnout, but you still can guide your wreckage through the air with careful use of the ability. High-value targets also see a return and making sure to destroy them plays a big part in getting a coveted Platinum medal on each level. 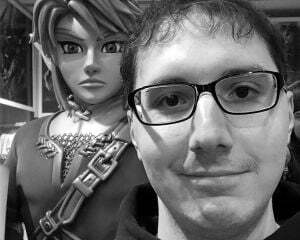 I only got there once, despite putting up some respectable scores on the leaderboards. 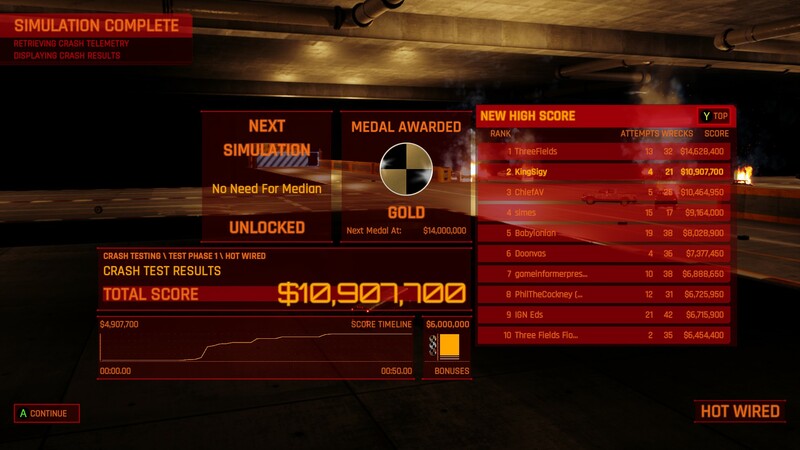 Where the differences come into play is that Danger Zone is actually more of a puzzle game than Burnout ever was. While dollar values for mayhem will determine your ranking on each zone, an emphasis is put on collecting tokens that will increase your score. These tokens take the form of Bronze, Silver, and Gold dollar signs and collecting them in the proper order (Bronze -> Silver -> Gold) rewards you with a massive point boost. 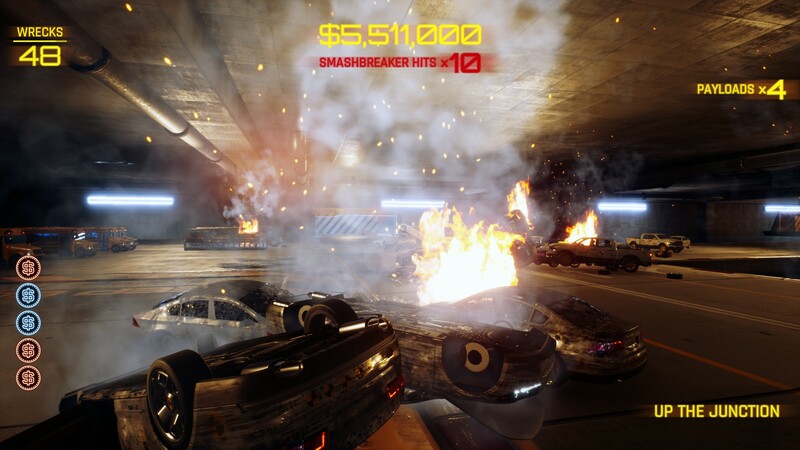 Now the idea is to not only smash as many cars as possible, but to set yourself up to fly around the arena and collide with tokens in a specific order. You only get awarded a single Smashbreaker for crashes, so it’s up to you to collect the other Smashbreaker power-ups scattered along the path of the medals. It can be infuriating to have a near-perfect run ruined by some renegade truck that blocks your path to the final medal, but it also makes for a one-more-try type of approach that keeps you addicted. The leaderboards can also provide that sensation, seeing as how they quickly and easily display at the end of each attempt. I’ve never been that big of a fan of score chasing, but at least there is some way to compare your skill with the outside world. It doesn’t replace actual multiplayer, but I’m willing to accept it since Danger Zone seems to be about recapturing Criterion’s glory and hopefully building up a new fan base. The level designs start off simple, but quickly ramp up the intensity. The very first level is the most basic of intersections as you can get, but soon after you’ll have to switch lanes between barricades, speed directly towards traffic on a divided highway, and launch yourself about half a mile over a gap and then fall into a tunnel. You can also outright fail levels if you fall off the roads. This rarely occurred in any of Burnout’s intersections, so it definitely feels like a nice way to increase challenge. Thankfully, restarts are super quick and the load times for booting the game up are almost instantaneous. The performance is pretty excellent, as well. While the press information warned that older PCs might have a tough time rendering all of the destruction, I didn’t notice a single bit of slowdown or any kind of glitches on my machine (which was built in 2013). Even when I was blowing up and throwing a bunch of cars and car parts in all directions, Danger Zone remained stable. It doesn’t look spectacular, but the game isn’t shoddy, either. When you collide with other cars, you’ll see a ton of sparks, smoke, and things like mirrors, wheels, and doors disconnecting and crumbling in a realistic manner. Viewing the aftermath also has cars sounding their alarms, which was a wonderful touch in Burnout. Really, what is most impressive about Danger Zone is that a small studio with a not-so-stellar track record managed to create a game that feels like Burnout. The amount of content might be disappointing, but Three Fields isn’t asking for full price here. You really can’t complain about the price-to-gameplay ratio with Danger Zone. Maybe I’d like to see some more cars, different backgrounds, and possibly a soundtrack, but I can live with what is being offered. The game will officially launch at the end of the month, on May 30. It's coming to PS4 and PC, with no plans for other platforms. While Danger Zone might end up being more of a proof-of-concept for a full sequel, I certainly had fun with the preview build. I’m looking forward to seeing how radical some of the later course layouts can get.